I hate this image. Passionately. The reason I hate this image is because it is probably the biggest visual lie I’ve ever seen. In his book The Visual Display of Quantitative Information , Edward Tufte has a concept called the “Lie Factor”. The “Lie Factor” judges the extent to which the data and the visual are out of sync. Nothing could be more out of sync with reality than this image. While it imagines the appropriate number of objects circling the earth, it completely misrepresents the scale of those objects. Space is unimaginably huge. While there are thousands of objects circling the earth, they range in size from a volleyball to a small school bus. If you do the calculations, the objects in this image range in size from Delaware to Tennessee. In this image the diameter of the earth is about 1950 pixels. The real diameter of the earth is about 8000 miles. That means that every pixel is a shade over 4 miles. The smallest piece of space junk in this image is about 10 pixels wide and 18 pixels tall and the largest one is about 24 pixels wide and 104 pixels tall. That gives the small objects an area of about 3000 square miles (about 30% larger than Delaware) and the large ones an area of 41,000 square miles (a shade smaller than Tennessee). To give an example of this exaggeration, let’s look at Angelina Jolie. (How’s that for a non sequitur?) Jolie has a freckle (beauty mark, mole, whatever) above her right eye. Imagine the Photoshop is done a shade better than I can do. The intention to do good and get people to realize the severity of melanoma is all well and good, but it doesn’t justify lying to people. Granted, the space junk image holds the disclaimer that it is “an artists impression”. But that isn’t how people read these kinds of things and anyone who believes otherwise is, quite frankly, lying to themselves about the realities of human perception and belief. People see these images and they expect that they match reality in some way. 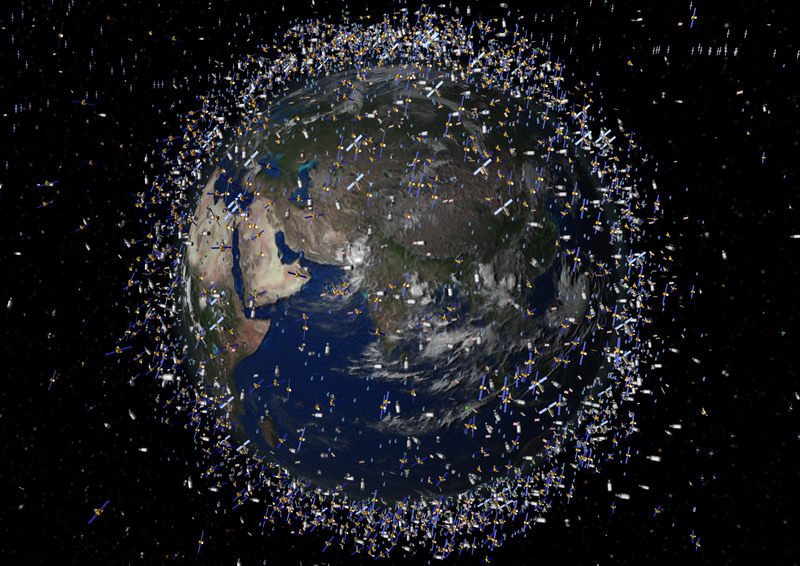 Do a search for “space junk” to find out how many otherwise intelligent people have accepted this image as reality without a breath to admit how inaccurate it is. This is not to say space junk isn’t a problem. I would have “solved” the problem of visual representation by portraying the space junk as a dot. A single pixel that can clearly indicate position instead of pretending to be a representation of size. Then, I would explain that, even though these objects are very tiny compared to the size of the space they’re in, this junk moves at thousands of miles an hour… making very small objects insanely dangerous. You could effectively compare it to shooting a bullet into the air. A tiny piece of metal in a huge space can be really dangerous. People get that. There is no reason to portray the bullet as a 747. There is an extent to which many people in scientific and technical journalism are content to give people the appropriate impression (“Space junk is a dangerous problem”) without providing them with the appropriate information. Or, to put the problem simply, they think the end justifies the means. I take the view that truth in data is the highest importance. I’m frustrated in how lonely it is out here on my high ground. Your stupid. Obviously the image is not supposed to be a realistic representation, but a graphical comparison to help ILLUSTRATE the number satellites, and the amount of “space junk”. The graphic is intended to be viewed by those smart enough to realize that…a test you obviously failed. Stop QQing about s*** that you’re too dumb to figure out. and next time, use an example that’s relative to your point. Showing how big you can make a freckle in photoshop is hardly a convincing argument, nor was it funny. You want truth in data? Think about what the image is meant to show: That there are a lot of f***ing satellites out there. NOT that the satellites are the size of f***ing texas. Truth. Ha. you wouldn’t know truth if it bit you in the a**, because you don’t even know how to interpret a stupidly easy graphic. It’s “You’re stupid.” Two words, “you” and “are” make a contraction, which requires an apostrophe. Seeing as this was the intellectual high point of your comment, I’ll ignore the rest except to say this: It’s a really good idea to use obscenities when correcting someone. It lets everyone know how incredibly smart and serious you are. I’ve edited your comment appropriately. Was this what your tweet about “smugness” is about? Incidentally, this is what the Reason Hit & Run folks would recognize as “Joe’z Law of teh Interwebz”, which states that any time you are attempting to correct someone or seem intelligent, you will undermine yourself with bad grammar. Oh man. I get a really good laugh when someone tries to argue a really bad point with bad grammar and worse language. I really wish Dan would at least answer because I’m itching for a go at stooping down and playing in the mud. PS. It’s probably my favourite thing in the world when someone calls a person stupid and doesn’t spell the ‘you are’ contraction right. “Your stupid!”, “Ya, well, what about my stupid?”. I hate how America turned its back on the solar system. It makes me sick thinking about it. As someone who with years spent building satellites and other flight hardware, I thought the article was on the money. There are both a lot of objects out there and a huge amount of space. It’s not uncommon for the STS to return with dings on it from space junk. My take on the original article is that few media and/or people think critically on this (or many other) subjects. They’ll take most images as “the truth”. I’d have to agree with the original premise of the article. I’m pretty sure that image is a screen cap from Wall-E. I would add that the altitude of these objects should play a crucial role in your calculation. a satellite can orbit the earth at an altitude of up to 36 000 km. so you should really pay attention to this difference in perspective when comparing the pixel size of an object in the atmosphere to the pixel size on earth of e.g. Delaware. It wouldn’t proof you wrong. the satellites are much to big. but your comparison with delaware is also wrong. Actually, that makes the comparison to Delaware far too small to be good one. I was using a 2-dimensional concept that basically assumed that the objects were on the earth surface. This was in order to give the benefit of the doubt and make the numbers as friendly as possible to the creators of the picture. As you increase your distance from the earth, the volume in which the space junk exists increases dramatically, which means that the space-junk-to-space ratio drops dramatically. Translation: If you have more space, and the same amount of junk, the junk is even more spread out and the cluttered looking picture is even less representative of reality. Assuming that most space junk is either semi-synchronous or geosynchronous (which would make sense given that much of it is from satellites), we’re dealing with a volume of space that is about 100 times bigger than the volume of the earth. Earth volume = 260 billion cubic miles, volume of geosynchronous space (minus earth) = 23 trillion cubic miles. That means that, in order to get a picture as cluttered as the one above, you would have to increase the size of the space junk well beyond the size of Delaware (which is basically a 2D estimation, not a 3D one). But I think it’s pretty obvious that the creator of that picture didn’t take into account altitude and simply placed the space junk within a 1000 mile space around earth. Why would they do this? Because (and this circles back to my point) they didn’t care about accuracy… they only wanted to create a cluttered picture that made people say “Oh my god, that’s horrible!” But the more you dig into it, you realize that this picture is absurdly inaccurate. And my comparison to Delaware is far more generous than they deserve. While the image generally fails, it also succeeds in informing about the problem of orbital debris that circumnavigates the earth. A previous poster mentioned dings in the spacecraft we currently use, as well as an active satellite striking an inactive satellite, presumably by accident. Polluting the space just outside our atmosphere is creating a danger only to ourselves and a potentially catastrophic one if you’re a human in orbit. While a lot of people have died in pursuit of space, it would be sad to relegate future deaths to “traffic accidents” that are inevitable. The solution I guess would be to immediately stop adding to the debris field as much as possible, allowing existing debris to slowly fall out of orbit. Newer satellites, or outfitted older ones, could actively strike down or alter the orbit of known problem objects. This would have to include only unidentified or universally-accepted “dangerous” objects, never including any known government or privately-launched satellites. The ring of debris around Earth may become the final frontier. I tried to make the point that just because the image is a load of crap doesn’t mean that there isn’t a problem. But that’s the difference between information visualization and out-and-out propaganda. Information visualization is concerned with understanding the information. Propaganda is concerned with pushing a perspective. That perspective may be a good one, but that doesn’t excuse the visual lie. I think you should leave the debris alone. Looks like it has the potential of protecting us from those nasty meteors that threaten earth every time there’s talk of a dooms day. They could be our shield.